Laika Upe, congratulations on being chosen for the semi finals of Supernova 2019! You are a relatively new band, tell us about your background? Hi and thanks for having us. We’re excited to be here and we are excited to be a part of the Eurovision 2019 song contest. We are five different guys from Latvia united together to play and make music. We have been playing together since the spring of 2016. All of us have had previous experiences in the field of music here in Latvia. Your song “Listen To The Way That I Breathe” is a real ear worm, I’ve had it on my mind for weeks now! I could widely describe it as melodic electro pop, but I’m struggling to give you a genre here. Tell us about the song and how it came about? Well, the song was written before by a good friend of ours Armands Varslavans who produced the song as well. In the course of a few months it was modified for ESC 19 regulations. So now it’s kind of a different tune but we actually dig the sound, power and the style of it. Yeah, the song definitely has that electro – pop – indie vibe to it. You have released an official video now, looks like it was a lot of fun! The shooting of a video was quite challenging because we really had to get over ourselves emotionally and physically. The video was shoot in several places. First, we had to film in a cold weather outside. After that we had to film under the water. With the lack of sleep from the previous night’s gig, that really did took an energy from us. We are happy about the result, though. I’ve seen previous releases from you in the Latvian language, and also in Russian. Are you happy singing in English for Supernova? Absolutely. We hope to get noticed outside the borders of Latvia so writing in English is crucial for that. And the first single in English made for Eurovision Song Contest – that’s a great start. Is Supernova and the Eurovision Song Contest something that you usually follow at all? We actually do follow it. And we finally decided to participate there as well, because it’s a great platform for a musicians to get noticed by a wider (international) audience. It’s a great opportunity to gain an audience. You never know that the person who is listening you may be a producer who can turn your career for the better. So yeah, we believe that it is essential to participate in such song contests, ESC being one of the biggest and the oldest ones. Latvia have been incredibly unlucky in Eurovision over the last few years, do you think this has changed the feelings of the public towards the contest, or is there still that hunger for success? We believe that as long as there are participants, there will be an audience who supports them. We Latvians, always try to support each other in sport, music, art, you name it! What’s in store for Laika Upe in 2019 following Supernova? You are known as a live performance band so I hope there’s plenty of those planned! 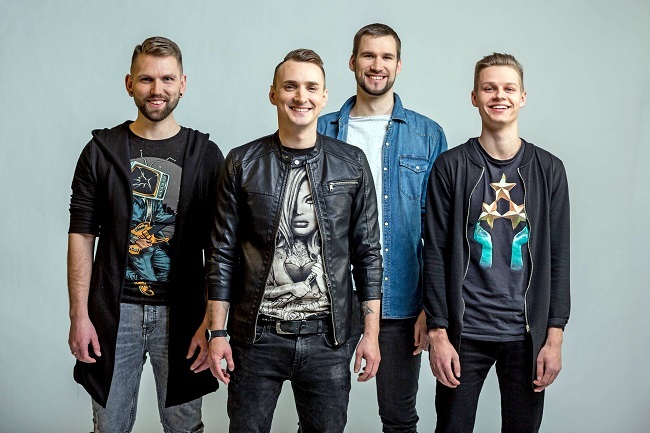 Many thanks to Laika Upe for their time, watch the fantastic video for “Listen To The Way That I Breathe” here and stream the song on Spotify here which will count towards the public vote! Vote in our poll here for YOUR favourites in Semi Final 2, and follow us here on ESCBubble as we take you through the show and don’t forget, we will be bringing you exclusive content from the studio on the Grand Final on February 16th!